The Holiday season is quite different in France than in the United States. The majority of France is Roman Catholic so the holidays are centered around Christmas. School children have 2 weeks off for "les vacances de Noel" which builds a lot of excitement waiting for Santa's visit. In France, Santa is called Pere Noel and fits the same imagery as the United States: an oversized, red coat with white trim, and a snowy white beard. The sleigh is pulled by reindeer, but Rudolph is nowhere in sight. Good children get presents, but they aren't required to leave milk and cookies for Santa during his visit. Naughty children do not get a lump of coal, they get a visit from Pere Fouettard, which loosely translates into "Father Whip". Pere Fouettard's job is to whip the children that misbehaved. Needless to say, French children are towing the line when Christmas comes around. There are no stockings hung on the chimney, but children put their slippers under the tree, or in front of the fireplace if they are fortunate enough to have one, for Santa to fill up with toys. There is a very famous pop song about the son of Pere Fouettard dating the Pere Noel's daughter. It is by Jaques Dutronc and relies on the second degree humor, which is very important to the French. It's called "La fille du Pere Noel" and hits heavy rotation on TV and radio in December. The Christmas decorations are mainly handled by the city councils around the country. The illuminations are concentrated in the high traffic, tourist and commercial areas. Nobody would think of putting Christmas lights on their house. The most decorations private homes will display might be a glimpse of the Christmas tree from one of the windows. A Frenchman would never have an inflatable Santa in their front yard. 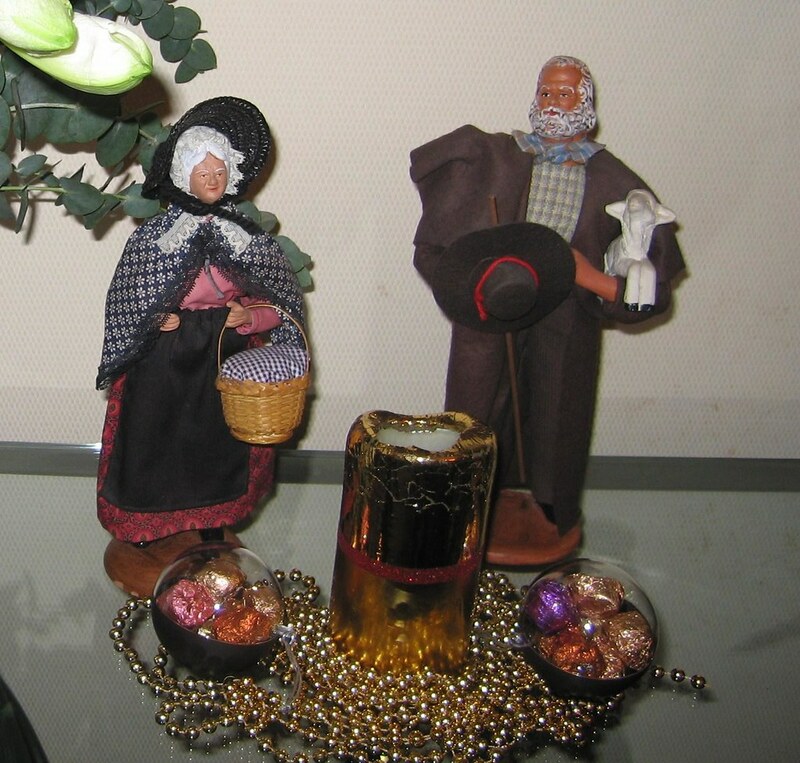 The standard decorations in the French homes are the Christmas tree and the Nativity called la "creche de Noel". The most popular kind of nativity scene are the Provencal "santons" made out of clay and painted to represent both biblical figures (baby Jesus, Mary and Joseph, the three wise men) as well as traditional Provencal characters that would have been found in a typical 19th century village: the miller, the shoemaker, the baker, the shepherd, etc. This is our take on the Christmas village houses that are popular United States. Christmas markets originated in the east of France due to the German influence that is still present today. They have spread out to major cities as a way to create a festive atmosphere either on the main square of the town or on major roads. For example, Paris has now two Christmas villages, one on the Champs Elysees and one on the La Defense plaza. Christmas markets are typically held in small wooden "houses" in which merchants sell handcrafted toys, decorations and artisan foods. The unofficial drink of those markets is the vin chaud or mulled wine which helps people warm up as they shop. The American Christmas tradition of baking Christmas cookies, does not take place in France. In the east of France they make the German Bredele, which is the closest to the Christmas cookie one may find. Christmas sweets are mainly left to the professionals: chocolate assortments, marzipan fruits, fresh fruit arrangements and the seasonal confection, Marron Glace, or candied chestnut. Marron Glace is only available at the end of the year. The French children borrow from the German tradition and enjoy a daily piece of chocolate as part of their advent calendar. 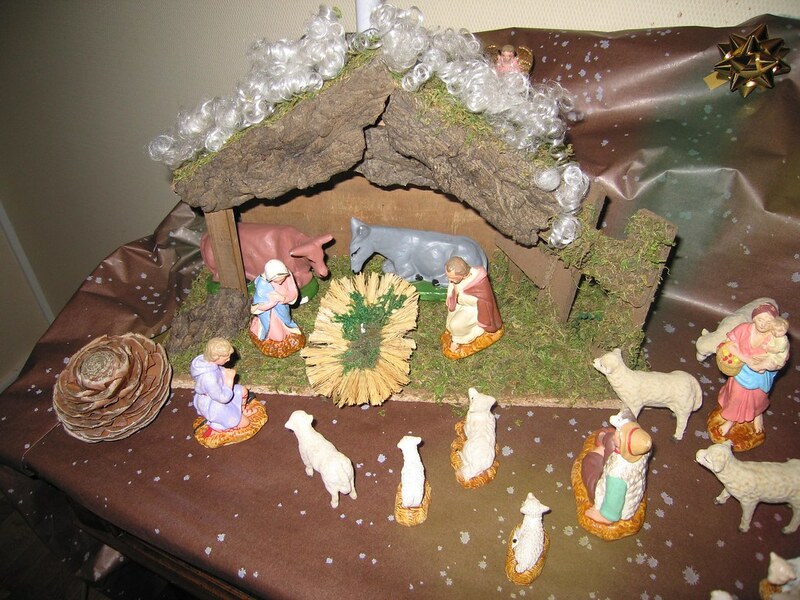 Christmas eve is called "reveillon" and is the main attraction of the Holidays. Everybody that is hosting a reveillon will set their tables with the best china, crystal and silverware. A traditional reveillon would have petits fours or amuses-bouches served first while the guests enjoy a flute of Champagne. Then foie gras would be served, followed by a seafood appetizer: either cold smoked salmon (preferably from from Norway, although Scotland is making a run for the Nordse's supremacy). The entree would consist of either chestnut-stuffed turkey or a roasted foal (duck or goose). Then salad, followed by a cheese tray before the dessert, which would be the yule log cake or buche de Noel. It is a genoise cake that is filled with whipped custard, rolled and glazed with chocolate ganache. The decoration of the cake is made to look like a tree log lying in the forest, complete with marzipan holly leaves and meringue mushrooms, preferably with a dusting of confectioner sugar to simulate snow. The reveillon is typically served after the midnight mass if people attend the early service or before if they attend the actual midnight option. Christmas morning is spent either opening presents very early or sleeping in very late, depending on the children in the household. The Christmas tradition of children waking early and running to find their gifts transcends both cultures!